China remains the world's largest producer of tea, the total area of its ​​tea plantations cover over 1.2 million hectares of land. 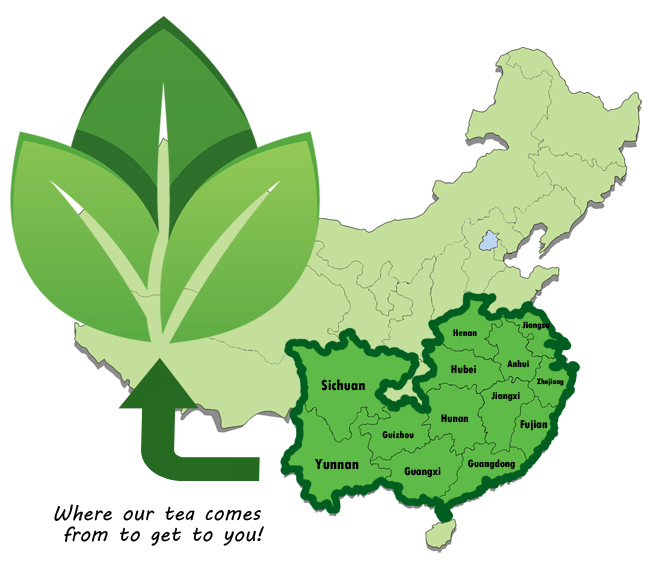 Every variety of tea is produced within China, from cheap, mass produced teas all the way to the gourmet, artisan teas of the smaller plantations. Fujian Province is located on the South East coast of China, facing Taiwan. The province has been developing its local tea-growing techinques since the Song dynasty. In the nineteenth century, Fujian was the undisputed leader in the production of tea in China, and hence, the entire globe. The province is famous for the quality of its teas, in particular its Oolong and White vareties, however, it is also home to some renowned Back teas such as Lapsang Souchong and Keemen Black. Undoubtedly, Fujian is the finest tea growing province in the country. Other than a few small areas bordering Shanghai, the whole of Zhejiang province is one huge plantation. Red soil and a mild subtropical climate contribute to the development of a tea growing region that produces Green tea all year round. It is here that you will find the world-famous Dragonwell green tea. Zhejiang today accounts for almost three quarters of total tea production in China. Located in the lower reaches of the Yangtze River, Anhui is a major tea-growing province in China. The province is divided into two regions - the north and the south, with ​​tea growing in the northern region dating back to the Tang dynasty (618AD-907AD). This south-western province was the first part of China to see the popularization of tea culture, consumed en masse as an everyday drink rather than a form of medicine. Today, anyone passing through Sichuan will not fail to notice the central role it still plays in peoples lives. A temperate, humid climate allows a lot of tea to be produced in this region and it remains today one of China's major tea producing provinces, producing many well known brands of Green and Black teas. Yunnan Province is located in southwest China. Tea Culture in Yunnan dates back to ancient times and is regarded by Chinese scientists as the home of tea and indeed, it is here that you will find the oldest wild tea trees in China. 98% of tea produced in Yunnan today is of the Puerh variety. Bordering Zhejiang, Jiangsu Province has been growing tea since the seventh century. Washed by the waters of the Yellow Sea, the province has good natural conditions for tea which is grown together with fruit, producing the deliciously fruity Spring Snail Green tea. China's Hubei Province, home to China's first and foremost tea specialist, Lu Yu. Tea Production in Hubei started all the way back in the eighth century. Its eastern counties, bordering the province of Anhui, are considered some of the oldest tea-growing areas in the country. Most of the tea plantations are located on mountain slopes at an altitude of 1,000 meters above sea level. The province grows and produces Green and Yellow teas. This central province is one of the main centers of tea production in China. In the 19th and ealry 20th century, Hunan produced almost half the total volume of Chinese tea. Tea growing is encouraged by favorable soil and a warm, temperate climate. Henan Province is located in the central part of the country and is bordered to the south by the provinces of Hubei and Anhui. Its main tea-growing areas are located in the south, which have the same natural conditions as the two above mentioned neighboring provinces. However, tea does not play such an important role in the economic life of Henan province, as it does, for example, in Hubei province. Nevertheless, Henan Green tea is of excellent quality. Guangdong province stretches along the coast of the South China Sea and has tropical climate and an average temperature that exceeds 20 degrees all year round, allowing tea collection to be carried out 10 months of the year. In Guangdong, just like in Yunnan, there is also an abudance of wild, uncultivated tea bushes. The province is not a major supplier of tea, but has huge potential. In this southern province, bordering Vietnam, tea culture has only begun to gain ground in recent years. The main plantations are located in the east of the province, near the city of Guilin. Guizhou is bordered by Sichuan to the west and Yunnan to the south. Despite being surrounded by so many famous tea-growing provinces, tea culture has not seen any significant development here. Tea is none the less cultivated throughout the province on numerous small plantations.